This bar is topped with a sandy beach scattered with seashells, sand dollars and starfish made of soap. Each one is hand painted before being placed on the soapy beach! 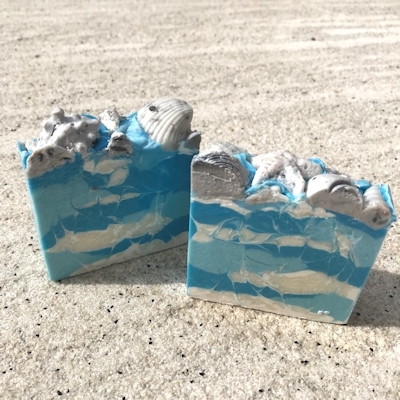 This bar is scented with a blend called Neroli & Shea - a clean smelling, tropical, floral mix of bergamot, neroli, lime, jasmine and orange blossom. Loaded with pampering oils such as mango and shea butter, this bar will delight your senses for certain! Approx. 4 oz. * All our products are vegan and cruelty free. Ingredients: saponified coconut, palm, olive, canola, castor, and avocado oils; shea butter, mango butter, vitamin e, titanium dioxide (food grade), fragrance, and mica. Topped with glycerin, hand painted sea shells.